To be honest, Tom and I were looking for a pub. Oh, we also planned to visit St Peter, because we knew it was somewhere in the area, but both of us had left our OS maps at home, and so we thought a gentle pint to collect our thoughts might be in order. I knew that Ingham was also somewhere near, and that the Woodforde's Brewery had recently taken on the Swan Inn there, and so that seemed ideal. But while we negotiated the narrow lanes, a rather handsome church tower hove into view. It was grander than I expected: it must be said that Brunstead is not usually accounted one of East Anglia's finer churches, but the setting was lovely, up a farm track in the woods, with just a big house for company. Unusually for this area, the church was locked, but there was a notice telling us that the key was at the house. I wandered up the long drive. Coming towards me was an old fellow pushing a wheelbarrow. I kid you not, he was the absolute spit of Paul Whitehouse's majestic Ted character in The Fast Show. I asked him where the key was, and he stopped, took his cap off, wiped his brow, and said thoughtfully "Arh, the missus is up in the conservatory". I can't do him justice, he was splendid. I felt as if I walking into an LP Hartley novel. I walked on, and a very nice lady gave me the key. I strolled back to the church, but the gardener was now nowhere to be seen - had I imagined him? The grand porch is of a piece with the tower. 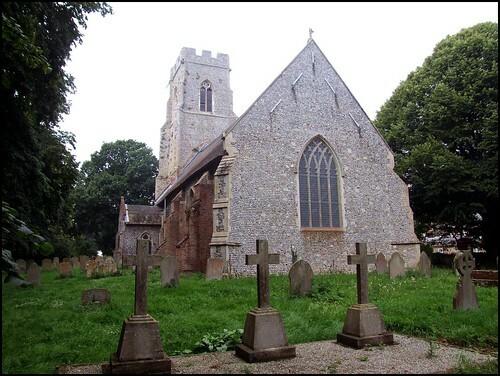 Sam Mortlock notes that the style, unusually for Norfolk, is early Perpendicular, while the body of the church is late Decorated. This suggests that the church was built in what was effectively one long campaign, punctuated by the horror of the Black Death. The interior of St Peter is almost entirely Victorian. There was an early restoration in the 1830s, which left what Mortlock described in the early 1980s as a bleak, bare interior. Certainly, nobody could today describe St Peter as grand or lovely, but there is a rustic simplicity to it, and it feels well-looked after and loved. One curiosity is a memorial to Charlotte Comyn, who died at the age of 73 in 1848. It doesn't tell us much about her, other than that she was amiable in person... and much respected for her good sense, but it does mention that her husband Stephen was chaplain to Lord Nelson, and was with him at the Battle of the Nile and Copenhagen.